Today I wish I could write a post full of transgender excitement and sweetness and light, but it is a cold drab day here in Southwestern Ohio. First of all I am feeling the effects of being chilled all the time. I started to feel that way as soon as I got into seriously taking HRT (hormonal replacement therapy). I found out the hard way why cis women always complained about being cold. I have been walking approximately a football field a day lately, so today I plan on doing it at a brisk pace. Also, I need to call my dog's veterinarian's office and find out how much it will cost to out her down. (euthanize her.) The poor dog is nearing 18, blind and can barely get around anymore. As sad it is becomes, I would wish someone could do it for me, if I ever reach a certain point in my life. Still, it is going to be so hard to bid farewell to one of my best friends. This is my "Lucky Buckeye" my daughter gave me for my birthday. 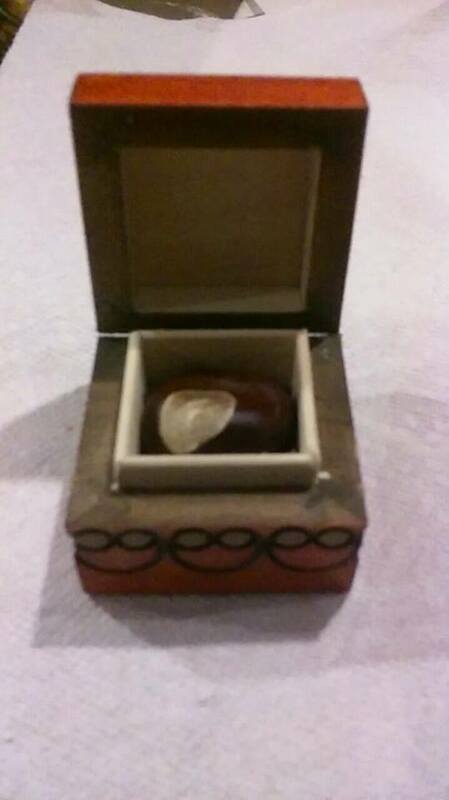 to put it in reference, Buckeye trees grow wild here in Ohio and their nuts are what you see in the box which is approximately 1 1/2 inch square. The Buckeye came from a tree I found as a sapling after my wife died. (She was as big if not bigger fan of The Ohio State University as I am.) During the huge game against Penn State Saturday, we were behind almost the entire game and I was about to give up...until we won! She (wife) made a huge deal of never giving up and she was channeling me not to do it either. I call the Buckeye my "Lucky" one because my daughter planted the weak sampling and over the years has nursed it into the tree it is today. Now that it is bearing fruit, she plans on "hatching more." So I know this post didn't contain much exciting content about transgender issues or the LGBT world, but I wanted you all to know a little more about what really can go on behind the scenes. I'm sorry about your dog. That's a difficult decision to make on your part, but I imagine that it is also painful to see a friend in such distress. The only dog I ever had was during my childhood. We got her just a couple of months before my father died of cancer when I was eight-years-old. I'm pretty sure the puppy was brought in to be a comfort for my little brother and me after the terminal illness took our father's life. For a few years, the dog was the only one who ever saw me cross dressed, and I took further comfort knowing that she didn't judge me at all. I was seventeen when my mother remarried a jerk who found the dog, not to mention my brother and me, a nuisance. I was so glad when I could get out of that house when I went away to college, and I'll admit that I was more concerned at the time about leaving my dog behind than I was my brother. When I returned home for the summer, my brother was there, but my dog was gone; "given away to a man with a farm." I never learned the whole truth, but that SOB was a sociopath who manipulated everyone with lies. My dog had more worth than did he. For me there is very little that is more exciting than nurturing a plant to maturity and then propagating from it.